For the semi-vegetarian’s in your life, serve up a big ole bowl of this Grilled Salmon and Vegetable Orzo Salad. It’s tossed in a creamy Greek style dressing that’s bursting with flavor and it’s filled with grilled veggies and salmon! Subscribe to my newsletter to get recipes delivered to your inbox! I go through these phases where I don’t want to eat meat. No beef. No pork. No chicken. The only meaty food I will eat while going through these phases are a few select seafood items. And sometimes I’m even hesitant with that. I’ve always been a huge animal lover. I’m the girl who will pull her car over and run out into a road to save a turtle that is trying to cross the road. I’m the girl who will catch bugs and lizards that I find in my house and then save them by putting them outside. When I was younger, I didn’t eat a lot of beef and you couldn’t get me to touch a steak. I’ve never been a huge fan of pork and usually only eat it if it’s spelled B-A-C-O-N. But I can live with or without bacon. Yeah, it’s pretty darn good. But it’s not something that I have to have. Plus, pigs are cute and I feel bad when I eat bacon. Or any pork for that matter. Same with cows. Cows are so cute. I feel bad when I eat beef. Usually not right when I’m eating but mostly after the fact. Seriously, this is an internal conflict that I have with myself often. I question why I eat meat when I’m such a huge animal lover. I question why I just can’t stop eating it. I’ve stopped eating it a few times. And I’ve gone without any meat, with the exception of a slice of grilled salmon, for over two months. That’s my longest stint ever. It happened after I watched Forks Over Knives. Yeah, if you haven’t watched that, it will totally throw you into the internal conflict of meat versus no meat. But alas, I eventually went back to eating meat. And so goes the internal conflict, once again. I’ve done a good amount of research on vegetarian versus vegan versus paleo eating lifestyles. They each have great benefits. I personally don’t think one is better than the other. I’ve seen evidence that supports the statement that people who live vegetarian lifestyles are generally healthier than those who live vegan or meat based lifestyles. And I’ve seen evidence that supports those who live Pescetarian lifestyles (avoiding all meats except for fish and shellfish) are healthier than any of the former. What it all boils down to: do what’s best for you, both ethically and health-wise. For me, my ideal diet would be strictly vegetarian. I can’t do vegan because there’s this thing called cheese that I absolutely will not give up. For now, while I once again try to make the transition from meat to no meat, I’ll stick to veggies and seafood. With all of this talk of vegetarianism and my love of seafood, I decided to share a tasty little salad recipe with you today. 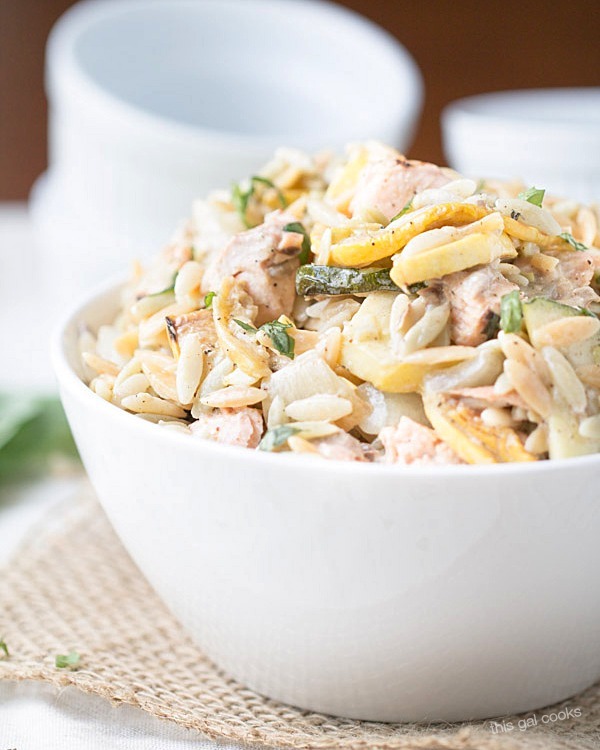 I made this Grilled Salmon and Vegetable Orzo Salad using some grilled salmon, squash, zucchini and onions that we had leftover from the previous night’s dinner. I tossed all of it with a simple dressing that I made with olive oil, Greek seasoning, red wine vinegar and a little mayo. I add the mayo to give it a little creaminess but you can leave it out, if you prefer. However, leaving the mayo out with alter the flavor of the dish. Enjoy the recipe. 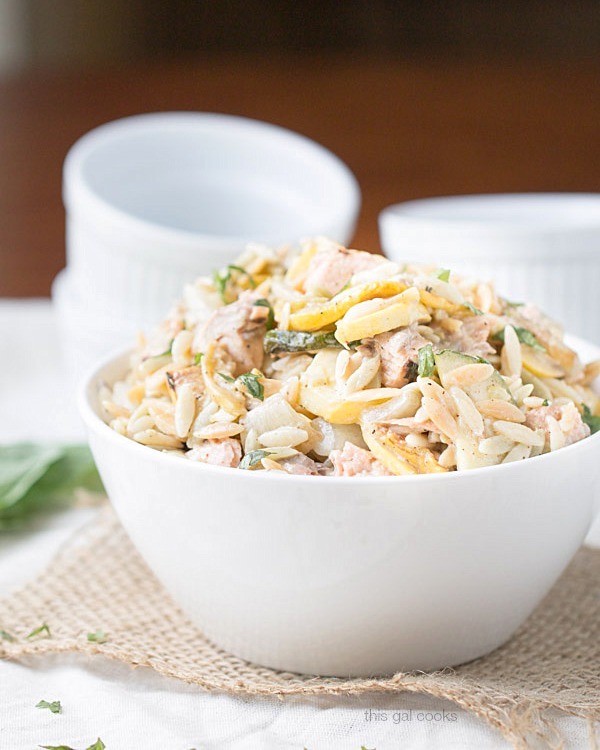 In a mixing bowl, toss together the orzo, veggies and salmon. In another bowl, whisk together the mayo, red wine vinegar, olive oil and greek seasoning. Pour over the orzo mixture and mix well. 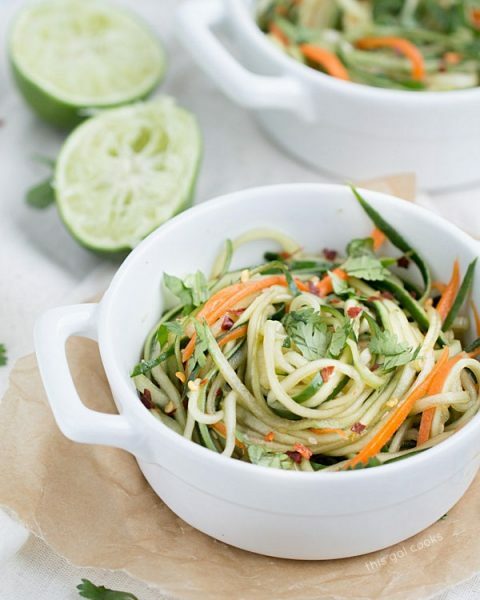 Try this Cucumber Noodles with Spicy Sesame Soy Dressing. Low carb and delicious! 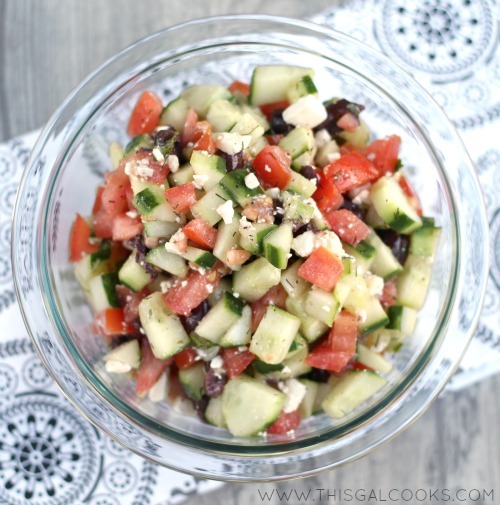 This Greek Cucumber and Tomato Salad is always a hit! 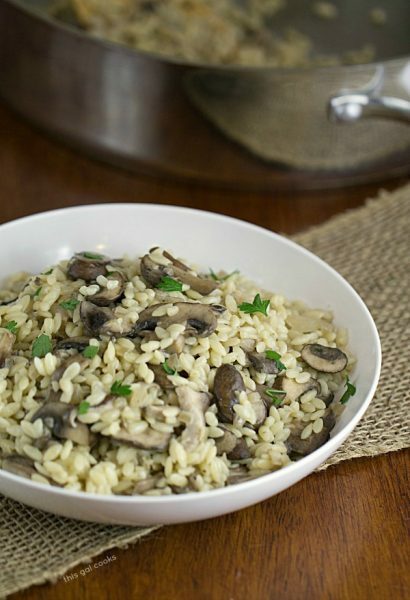 You’ll love this Savory Orzo with Mushrooms. Delicate yet filling! 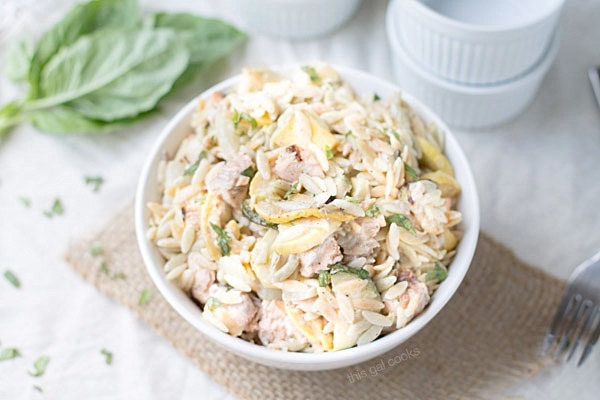 I like everything with salmon :) haven’t seen many salad recipes though :) looks really good..
Julie, I’ve been wanting to make a salad using orzo for ages but just haven’t got around to it yet. I love how easy and simple this one is. Sounds so tasty too with the salmon in it, which is one of my favourite foods. I could EASILY be a vegetarian if I could still eat fish (what did you call it? A pescatarian? Love it!) I totally agree with you though that you have to find what’s right for YOU and go with that. All the best with your ‘journey of vegetarian discovery’! Yes! A pescatarian. That is what people call it over here in the US. I think we have names for everything. LOL. Thanks so much for stopping by, Helen. Hope you have a great week! This salad looks delicious! Perfect for the summer. And I love that salmon is in here, too! Pinned! YUM! I love salmon, this looks so fresh and delicious! I can’t wait to give it a try. Totally understand about the eating animals dilemma. I applaud people who are vegetarian, but honestly, my bacon cheeseburgers just taste too good to give up :( I try not to think about it while I’m eating. Don’t make me talk about it anymore it’s making me feel worse! 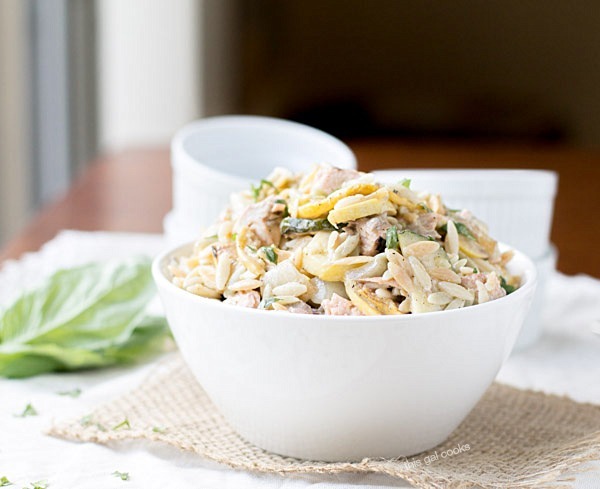 This is a great summer time salad! 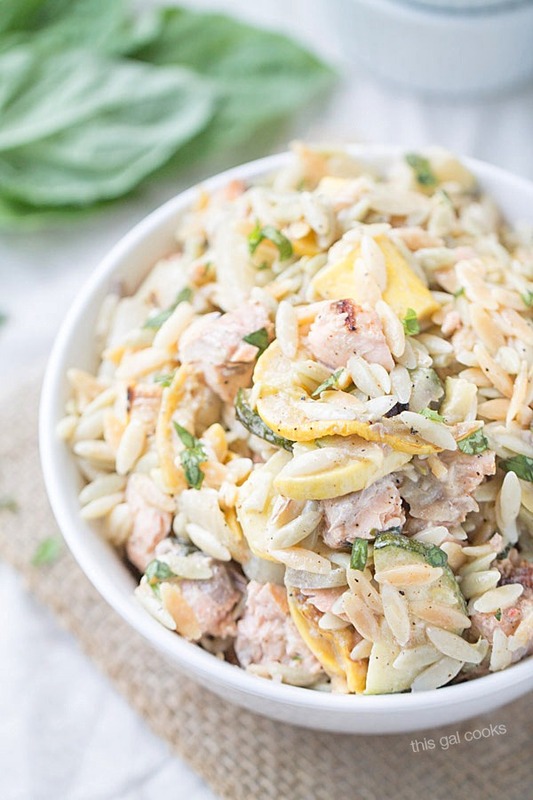 Salmon is my favorite and I love the texture of orzo. I don’t eat a lot of meat, mostly because I’m just not crazy about it. I’d rather eat fruits and vegetables than meat. But I do love fresh fish! 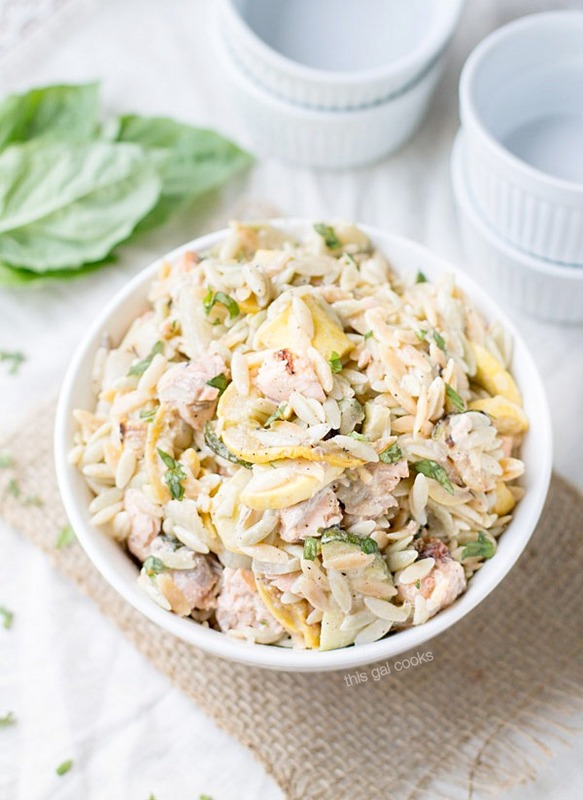 And this grilled salmon orzo salad looks perfect! Fresh fish, scallops and shrimp are something that I love. Probably a little too much to give up although, I don’t eat them all the time because they are a little pricy. But I love vegetables and fruits! Thank you so much for stopping by, Ashley! Julie, this looks and sounds just perfect! I totally understand the meat conflict – my husband is a huge meat eater and personally, I can go days and days without meat and not miss it at all. I do, though, love fish and seafood. Thanks for sharing this great recipe and pinning! You’re welcome! Thank you so much for stopping by and for the pin too! I probably shouldn’t watch that lol! I like bacon a lot, and turkey. But I agree, I can take or leave hamburgers. Totally with you on the cute piglets too! We saw a truck that was advertising this pork seller. All was good until we saw that on the side was the owner holding this adorable little piglet. What kind of advertising was that? Anyways, this dish looks incredible, all creamy and rich, but all from healthy stuff like orzo and salmon! I <3 orzo so much. Love it in this dish! For real, what kind of advertising was that? It wouldn’t make me want to buy their product! Funny story, this lady I work with told me that these people she knows bought a pig and wanted to name it. And they bought this pig to raise and then slaughter when it gets older. Um what? How can you raise something from the time it’s a baby, give it a name (which is what you do with a pet) and then kill it to eat it? I don’t think so! Julie, I’m the same way when it comes to meat! Absolutely in love with this salad… very gorgeous, pinning! Oh I hear you on this whole debate about food + lifestyle. And yes, cheese. All day. Cannot live without it. But meat? Also meh, over here. Loving these kinds of veggie + orzo/pasta/rice dishes especially in the summer. Looks great! I love pretty much everything in this, so I’m thinking it’s a win win. It looks and sounds soooo delish! Hi Bobbi! You’re welcome. Thank you so much for stopping by. Hope you have a great week! LOVE this recipe! I made it this weekend for some friends, and it was a hit. To be honest though, I think I preferred how it tasted before I added the salmon, so I’ll probably be using it as a vegetarian side from now on. Yum Yum Yum! I love everything in this salad. Orzo is one of my favorites. I am a meat eater to the fullest, I love bacon and would never want to live without it. Lean meats with a plant heavy diet and seafood is what I aim for. I think the Greeks have it right. However, I love steak, bacon and roasts all too much. Oh I’m totally back on the meat eating wagon. I go through phases where I don’t eat it but then I always go back. Because BACON. Yes, I need it in my life. :) Thanks so much for stopping by, Amanda!